Sir Alec Issigonis designed the Mini, which became one of the best selling cars in Europe and one of the most recognized cars ever produced. This car defined Issigonis’ philosophy “less is more.” Mini production started in August 1959 and was an instant success. This small British car originally came with an 850cc engine but through time was enlarged to 1275cc. Almost as soon as the Mini was out in the showrooms, Issigoni’s friend and racer John Cooper decided there was a need for a sporty Mini. He was loaned a production car and he fitted an engine out of a Formula Junior racing car. With this 997cc engine and its tiny 7 inch disc brakes, the Mini Cooper was born. The Mini Cooper was well received, with over 100,000 produced in 10 years. Production of the “original” Mini ceased in 2000. The BMW MINI was introduced in 2001. 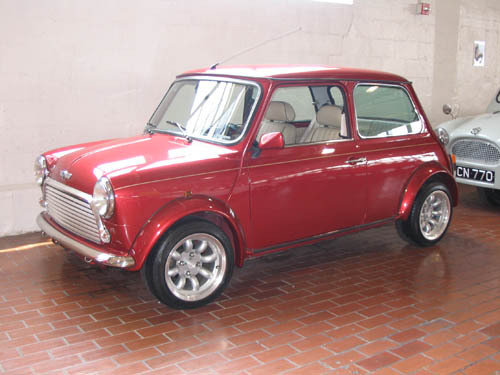 This 1971 Morris Mini has been updated to mid-1990 Rover Mini. Manufacturer: Austin Morris Division, British Leyland Motor Corp.